Placentalia is a term used in some taxonomic classification schemes for one of the three major branches of mammals that includes extant members, the others being Monotremata (montremes) and Marsupialia (marsupials). With its members known as placental mammals or placentals,, extant members are characterized by live birth of offspring and having the fetus nourished during gestation via a well-developed placenta. Marsupials also have a extra-embryonic, temporary vascular organ that forms in the uterus of females that is known as a placenta, but it is of different structure. In some taxonomic schemes, Placentalia is placed within the clade Eutheria within the class Mammalia. In this case, extant eutherians, their last common ancestor, and all extinct descendants of that ancestor are placentals. Some schemes use Placentalia in place of Eutheria, thus including those extinct mammals that share a more recent common ancestor with placentals than they do with Metatheria (marsupials and their nearest ancestors). Fossils of known placentals have been dated to 65 million years ago in the Paleogene. Placentals became greatly diversified and dominate after the great Cretaceous-Tertiary extinction event killed about 76 percent of species on Earth, including most of the dinosaurs ,with the placentals diversifying into the ecological niches previous occupied by dinosaurs and prehistoric reptiles. In some classifications, the mammals are divided into two subclasses (not counting fossils): the Prototheria (order of Monotremata) and the Theria, the latter composed of the infraclasses Metatheria and Eutheria. The marsupials constitute the crown group of the Metatheria and therefore include all living metatherians as well as many extinct ones. The placentals constitute the crown group of the Eutheria. While the classification of mammals at the family level has been relatively stable, different treatments at higher levels—subclass, infraclass, and order—appear in contemporaneous literature. Much recent change has reflected the results of cladistic analysis and molecular genetics. Results from molecular genetics, for example, have led to the adoption of new groups such as the Afrotheria and the abandonment of traditional groups such as the Insectivora. As with all other mammals, placentals are endotherms and amniote vertebrates, and have at most two generations of teeth, unlike reptiles in which there can be many generations of teeth. In mammals, the articular and quadrate, which composes the jaw joint in reptiles, is incorporated into the middle ear as the outermost two ear ossicles (malleus and incus; reptiles have only one ear ossicle, thte columnella). While in birds and reptiles, the large aorta leaving the heart bends to the right, in mammals it bends to the left (Archibald 2001). the presence of a malleolus at the bottom of the fibula, the smaller of the two shin bones (Ji et al. 2002). a complete mortise and tenon upper ankle joint, where the rearmost bones of the foot fit into a socket formed by the ends of the tibia and fibula (Ji et al. 2002). a wide opening at the bottom of the pelvis, which allows the birth of large, well-developed offspring. Marsupials and nonplacental eutherians have a narrower opening that allows only small, immature offspring to pass through (Weil 2002). the absence of epipubic bones extending forward from the pelvis, which are not found in any placental, but are found in all other mammals—nonplacental eutherians, marsupials, monotremes, and earlier mammaliaforms&mdas;has well as in other cynodonts that are closest to mammals. Their function is to stiffen the body during locomotion (Reilly and White 2003). This stiffening would be harmful in pregnant placentals, whose abdomens need to expand (Novacek et al. 1997). The exact relationships between these three lineages is currently a subject of debate, and three different hypotheses have been proposed with respect to which group is basal, or diverged first from other placentals. These hypotheses are Atlantogenata (basal Boreoeutheria), Epitheria (basal Xenarthra), and Exafroplacentalia (basal Afrotheria) (Nishihara et al. 2009). Boreoeutheria in turn contains two major lineages: Euarchontoglires and Laurasiatheria. Estimates for the divergence times among these three placental groups range from 105 to 120 million years ago, depending on type of DNA (e.g. nuclear or mitochondrial) (Springer et al. 2003) and varying interpretations of paleogeographic data (Nishihara et al. 2009). 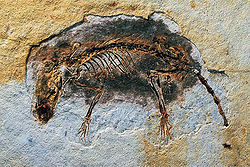 The earliest known placental mammal species (including Protungulatum donnae, Purgatorius coracis, and Leptacodon proserpinae) are all dated to the early Paleogene period, about 65 million years ago. O'Leary et al. (2013) place the oldest fossil placental, Protungulatum donnae, at 64.85 million years ago. The Paleogene, which begins at the end of the Cretaceous, spans from roughly from 65 to 23 million years ago (mya) and is most notable as the time in which mammals, including placentals, became very diversified and dominant after the great Cretaceous-Tertiary extinction event killed roughly 50 percent of the plant and animal families on Earth, and about 76 percent of the species (Barnosky et al. 2011; dos Reis et al. 2014), including most of the dinosaurs. True placental mammals appeared shortly after the K-Pg extinction event and quickly diversified into ecological niches previously occupied by various groups of dinosaurs and other prehistoric reptiles (O'Leary et al. 2013). True placental mammals (the crown group of all modern placentals) arose from stem-group members of the clade Eutheria, which had existed since at least the mid-Jurassic period (Ji et al. 2002). Dos Reis et al. (2014) claim that neither paleontological data nor molecular studies support a Paleogene origin of placental mammals and that Placentalia originated in the Cretaceous. This contradicts the view of those, like O'Leary et al. (2013), that posit the ancestor of placentals post-dated the Cretaceous-Paleogene boundary. Archibald, J. D., A. O. Averianov, and E. G. Ekdale. 2001. Late Cretaceous relatives of rabbits, rodents, and other extant eutherian mammals. Nature 414(6859): 62–5. PMID 11689942. Kriegs, J. O., G. Churakov, M. Kiefmann, U. Jordan, J. Brosius, and J. Schmitz. 2006. Retroposed elements as archives for the evolutionary history of placental mammals. PLoS Biology 4(4): e91. PMID 16515367. Retrieved May 2, 2014. Luo, Z., C. Yuan, Q. Meng, and Q. Ji. 2011. A Jurassic eutherian mammal and divergence of marsupials and placentals. Nature 476(7361): 42–45. PMID 21866158. Retrieved May 2, 2014. Nishihara, H., S. Maruyama, and N. Okada. 2009. Retroposon analysis and recent geological data suggest near-simultaneous divergence of the three superorders of mammals. Proceedings of the National Academy of Sciences 106(iss. 13): 5235–5240. Novacek, M. J., G. W. Rougier, J. R. Wible, M. C. McKenna, D. Dashzeveg, and I. Horovitz. 1997. Epipubic bones in eutherian mammals from the Late Cretaceous of Mongolia. Nature 389(iss. 6650): 483–486. PMID 9333234. Retrieved May 2, 2014. O'Leary, M. A., J. I. Bloch, J. J. Flynn, T. J. Gaudin, A. Giallombardo, N. P. Giannini, S. L. Goldberg, B. P. Kraatz, Z.-X. Luo, et al. 2013. The placental mammal ancestor and the post–K-Pg radiation of placentals. Science 339: 662–667. PMID 23393258. Retrieved May 2, 2014. Reilly, S. M., and T. D. White. 2003. Hypaxial motor patterns and the function of epipubic bones in primitive mammals. Science 299(iss. 5605): 400–402. PMID 12532019. Retrieved May 2, 2014. Springer, M. A., W. J. Murphy, E. Eizirik, and S. J. O'Brien. 2003. Placental mammal diversification and the Cretaceous–Tertiary boundary. Proceedings of the National Academy of Sciences 100(3): 1056–1061. PMID 12552136. Weil, A. 2002. Mammalian evolution: Upwards and onwards. Nature 416: 798–799. PMID 11976661. Retrieved May 2, 2014. This page was last modified on 3 May 2014, at 14:18.